John has a BBA in Small Business Management from Western Connecticut State University. He has over a decade of farming experience and enjoys preparing meals using local ingredients. John is currently a board member of Rural Vermont. Becky has a BA in Environmental Science and a BS in Medical Laboratory Science. In addition to the farm, she works in the Hematology Lab at DHMC. She has over a decade of farming experience and loves making animals happy by moving them to fresh pasture. Orla is a purebred English Shepherd. English Shepherds are versatile farm dogs that were never breed for show, and are good at hunting, herding and protection. Orla's favorite job on the farm is predator control. We know that the chickens are safe when Orla is on patrol, she once saved a laying hen right from the mouth of a coyote! 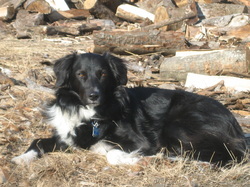 Tana is also a purebred English Shepherd and she is the Alpha on the farm. Tana loves working on the farm with Orla.